Twenty years on from the NME’s legendary C86 cassette, with anniversary shows featuring key artists planned at London’s Institute of Contemporary Arts and a Bob Stanley-produced documentary in the works, Tender Trap’s new album is striking proof that some of the original protagonists of that movement are still making intelligent and engaging pop music. As lead singer of the seminal Talulah Gosh, the proto-riot grrrl Heavenly and the classy pop act Marine Research, Amelia Fletcher was the voice and face that launched a thousand fanzines, an iconic presence whose influence can be traced in bands as diverse as Le Tigre and Belle and Sebastian. Together with her cohort in the latter two of those bands, Rob Pursey (guitar), and Marine Research drummer John Stanley aka DJ Downfall (bass), Tender Trap formed in 2001, releasing one album to date, the coolly electronic ‘Film Molecules’. With the addition of the crisp drumming of The Magnetic Fields’ Claudia Gonson, ‘6 Billion People’ marks a move away from the pared-down approach of its predecessor towards a sound recalling the best of the band's previous incarnations. This is immediately evident on the big chorused title track, Rob Pursey’s sub-sonic backing vocals uncannily reminiscent of erstwhile collaborator Calvin Johnson, while recent single 'Talking Backwards' is a pop rush of shimmering guitars and mellifluous vocals and ‘I Would Die For You’ marries a chugging rhythm to an ethereal melody. The short-but-spiky ‘Applecore’ ups the sass quotient as Amelia demands answers from an indecisive lover to a series of oblique questions over a stop-start bassline, whereas the spacey-keyboard sounds of 'Fahrenheit 451', the heartfelt '(I Always Love You When I'm) Leaving You' and the haunting album closer 'Dead and Gone' lend the album variety and depth. 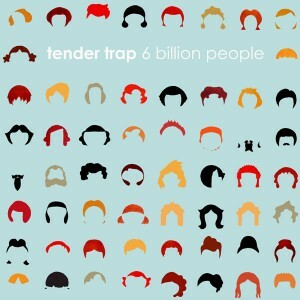 ‘6 Billion People’ is Tender Trap’s most fully realised work to date, a collection of sumptuous tunes and bold arrangements that makes a claim to be one of the best pop albums of the year. Perfect for fans of The Concretes, The Magnetic Fields, Le Tigre, and C86 indiepop.